You might be surprised, but yes, it is Sapphire motherboard with Intel chipset. Before you would never see Sapphire make any motherboards for Intel as they were AMD oriented. 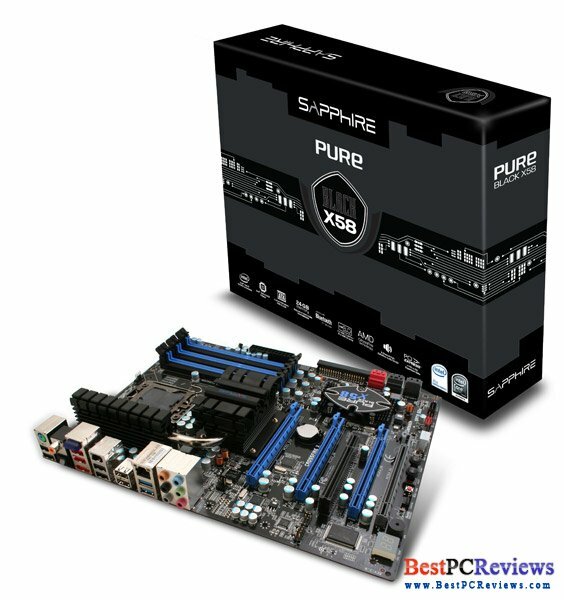 Sapphire Pure Black X58 is one of the most beautiful and fast motherboards on the market. 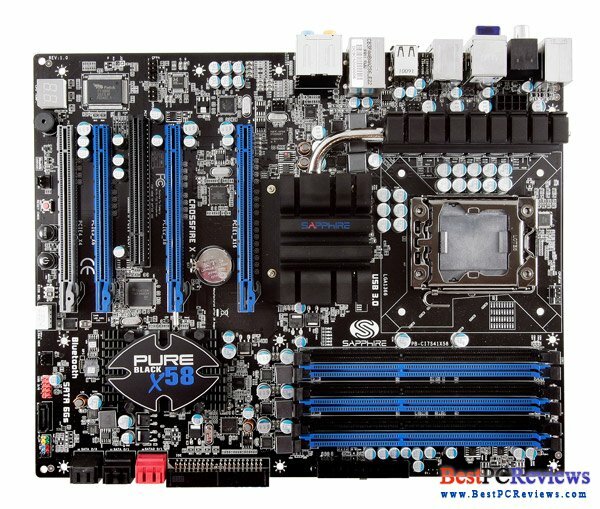 Read full review Before I go on, motherboard PB-CI7S41X58 is great because its X58 chipset. P67 chipset did not perform well and currently is unavailable. 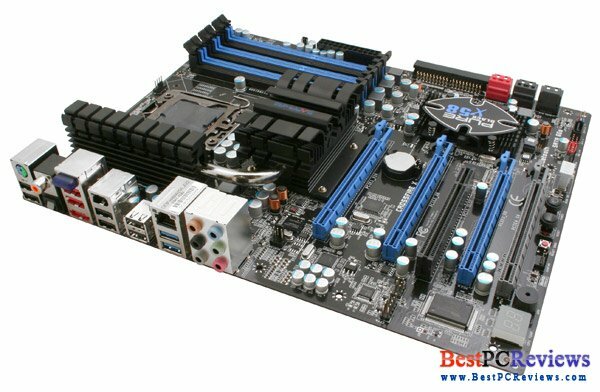 This motherboard based on X58 chipset and is for socket 1366. The name of the motherboard explains its style by itself. It comes in a black box. Inside of the box you will find black envelopes, letters, etc. The motherboard itself is mostly black, but has coupe blue colors on it. SATA wires for the mainboard are in black color as well. Sapphire did fantastic job in design of the motherboard. ATX Size 12" x 9.6"
This board is packed with cool features. One of the best features is LED that displays CPU temperature. Bluetooth is also supported, although it’s not very needed for desktop users. I liked the fact that there was USB 3.0 available on this board. Sapphire did a great job balancing the number of USB 2.0 and USB 3.0, putting eight 2.0s and only two 3.0s as most electronics are still using USB 2.0. As was mentioned hundreds of times, I hate overclocking, but this motherboard would be great choice for all overclocking fans as it does a great job at putting your CPU to the limits. If you are NVidia video card fan and want to use two or more cards at the same time on this board, this motherboard will not make you happy. However, if you are into using ATI video cards, you can put three cards together using CrossFire technology. If you are gamer or a video editor, or any other editor, using three monitors at the same time might be very helpful and fun for your necessity. So we know that the motherboard offers outstanding performance and beautiful style. The price of this board is kind of expensive, $260. But keep in mind that this is brand new chipset; therefore, we know that after couple months, price of those boards will drop down dramatically. If you are like me, you can wait, if you can’t wait to get new toy, go for it because you won’t be disappointed with the performance, style, and tons of cool features.